Background: Tuberculosis (TB) is the second leading cause of mortality worldwide being a highly contagious and insidious illness caused by Mycobacterium tuberculosis, Mtb. Additionally, the emergence of multidrug-resistant and extensively drug-resistant strains of Mtb, together with significant levels of co-infection with HIV and TB (HIV/TB) make the search for new antitubercular drugs urgent and challenging. Methods: This work was based on the hypothesis that an active compound could be obtained if substituents present in some other active compounds were attached on a core of an important structure, in this case the indole scaffold, thus generating a hybrid compound. A QSAR-oriented design based on classification and regression models along with the estimation of physicochemical and biological properties have also been used to assist in the selection of compounds. Chosen compounds were synthesized using various synthetic procedures and evaluated against M. tuberculosis H37Rv strain. Results: Selected compounds possess substituents at positions C5, C2 and N1 of the indole ring. The substituents involve p-halophenyl, pyridyl, benzyloxy and benzylamine groups. Four compounds were synthesised using suitable synthetic procedures to attain the desired substitution at the indole core. From these, three compounds are new and have been fully characterized, and tested in vitro against the H37Rv ATCC27294T Mtb strain, using isoniazid as a control. One of them, compound 2, with the pyridyl group at N1, has an experimental log (1/MIC) very close to 5 and can be considered as being (weakly) active. In fact, it is more active than 64% of all indole molecules in our data sets of experimental results from literature. The most active indole in this data sets has log (1/MIC)=5.93 with only 6 compounds with log (1/MIC) above 5.5. 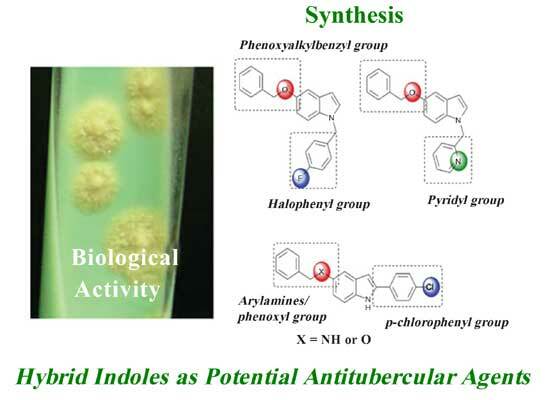 Conclusion: Despite the lower activity found for the tested compounds, when compared to other reported indole-derivatives, these structures, which rely on a hybrid design concept, may constitute interesting scaffolds to prepare a new family of TB inhibitors with improved activity. Antitubercular agents, indole derivatives, hybrid structures, QSARs, synthesis, biological evaluation.